Technically skilled enthusiasts of the 1930s loved to race the legendary B.B. Korn cars around the club tracks. Called tether cars or spindizzies, they reached incredible speeds, and inspired thousands to improve and invent. The founder of the B.B. Korn Manufacturing Company, Barney Korn, produced several tether car models that now, as vintage antiques, achieve astounding sums at auction. 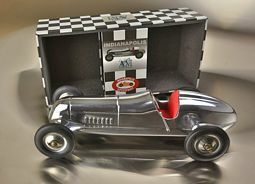 For the children of his clients Mr. Korn designed and built “The Indianapolis,” a non-powered pre-war giveaway. It was meant to enthuse children and get them to participate in motoring activities. 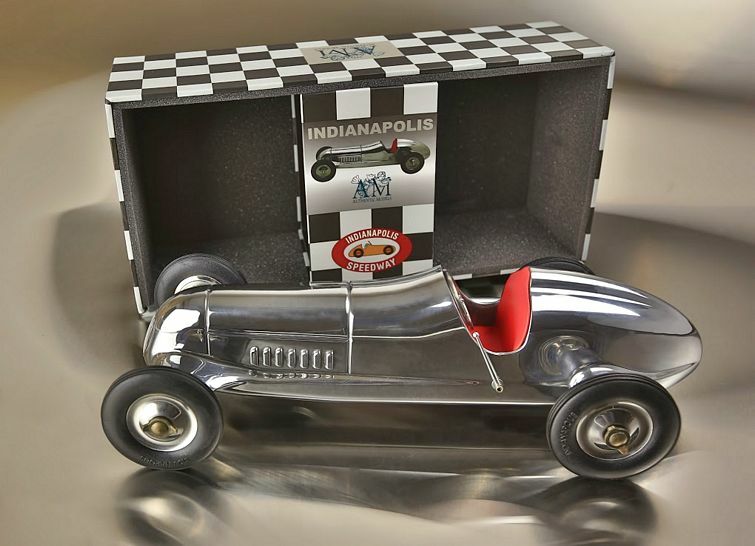 Our Indy ‘toy’ car pays homage to Korn’s legacy with detailed dash, rubber tires, and hand-polished aluminum body.